I haven’t read your novel, but I can imagine what it’s like. I think it is an excellent exercise in the use of your imaginations. I’m pleased with you for writing it. But now you must begin to look around you here at home. Use all of your senses to find out what kind of a place you are living in. as well as how it looks. you will put your real experiences into them. My friend Noel and I were sitting in her van, waiting for the key to a building. As we chatted, she looked straight ahead and said, “Carol Ryrie Brink grew up in that house. You know the author of Caddie Woodlawn?” My eyes widened as I nodded. At one time I loved Caddie Woodlawn more than Laura Ingalls. “She wrote several adult novels about the early days of Moscow,” Noel continued. “You might like them.” I put the titles on my wishlist and waited. This summer I am on a Carol Ryrie Brink reading streak. 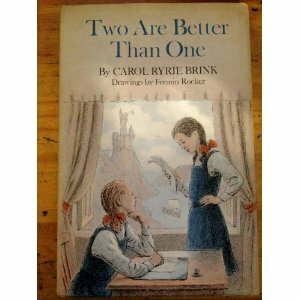 Before I began her trilogy about Moscow, ID, I read a little-known children’s book. a comical one to be sure, but an enemy nevertheless. …we didn’t mean it for hate. We thought it was—well, sort of funny. It made us feel better. The girls go to some parties and begin to neglect the dolls. They serve punch at a college dance. The novel gets finished and Chrys and Cordy decide to stage a wedding for the dolls. This back and forth between the little girl and the almost grown-up mimics the conflict I’ve witnessed in adolescent girls. This entry was posted in Uncategorized and tagged bookreview, carolryriebrink, quotes by alivingpencil. Bookmark the permalink. Caddie Woodlawn was the first book I bought at my elementary school’s book fair. It was so difficult to choose just one. I am ashamed to admit that I never thought to read the author’s other books.What a neat bit of trivia about Moscow! Carol,I often read your reviews but seldom comment because I can never figure out how to make it work. (I’m technologically ignorant, I’m afraid.) However, I’m giving it another try because I have to say how much my girls love Caddie Woodlawn now and how much I loved her as a child. We’ve also read a collection of short stories about the Woodlawn family (our library book was called Magical Melons, but I believe it has been reprinted as Caddie Woodlawn’s Family). I will be on the look out for this book. It sounds wonderful!